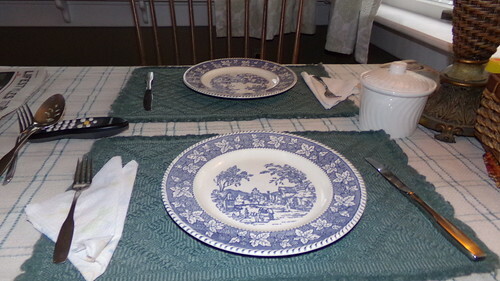 Got the table all set for Paul’s arrival back home with the food. Clams! Scallops! Shrimp! Dube’s famous Onion Rings! Will you look at all that tartar sauce? I asked for extra, and Paul doesn’t like it, he uses ketchup! (men!) but not me, I like tartar sauce on my fried seafoods! (Neither of us ate the bread – it came with the dinner but it’s not really our thing). This is the amazing cake I made yesterday afternoon. Found the recipe in Joy of Cooking cookbook. I can’t say enough about this “Lightning Cake” – it is just too yummy for words really. Take my word for it. 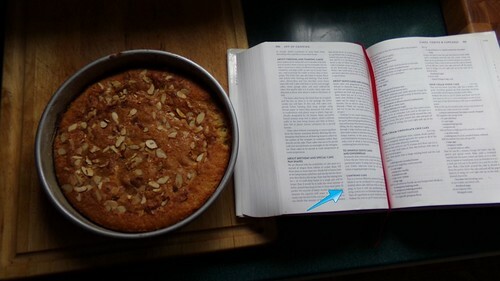 If you have this recipe book, go make this cake. For something special, or just for YOU – because YOU are special every day! So, we gorged out on the above feast. It was just divine. Before we knew it, it was over, leftovers were put away, dishes were washed up, dogs were let out/in, and we retired to the TV room to watch a new DVD I’d gotten yesterday in the mail called “Shetland” – it’s a series of murder mysteries taking place in the Shetland Islands of Scotland. 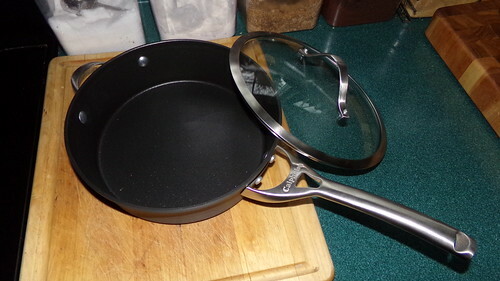 My present from Paul – just what I’d asked for a few months ago… a Calphalon deep sided braising skillet. I cut out a picture of it when it was on sale a while ago, and he put that little picture in his wallet. He found it for the same sale price at Home Goods just up the street from here so kudos to Paul – a shopping job well done! (And for Nina – no I didn’t get a card, but that’s probably because I read him your entry about Ed and Whole Foods and the card, etc. and we had a good chuckle over it, and I told Paul I do not want a card… just a waste of his hard-earned dollars – so he and I agreed… no card. Just a present (which I wasn’t really expecting, but now I’m thrilled to have it). We were even able to manage a tiny slice of the cake after supper, well into our mystery movie… the reason it looks like there’s a lot gone is that I had a tiny piece in the afternoon, when it came out of the oven, just to make sure it was edible and that we would both like it. It was and we did! So that’s over with. We can move on to our next big adventure which is the fact that in two days, Em has to go to dog-doctor’s and have surgery, a fatty tumor removed and her teeth cleaned. Under anesthesia. Maggie – I’ll explain: When I was making my entry, I typed in the title first (which I usually don’t do til the end – as it won’t “send” it out with no title) – so I typed in the first word of the title “The” meaning to continue with the rest of the title “The Day After…” but I hit a wrong key and it got sent out with only that one word for a title and no entry yet!! This is why I recommend doing the entry first and adding a title at the end, at least here at JS. When you got my notification, it was probably right when that happened but I hadn’t even written the entry yet, and that takes me a while, as you well know, what with photos etc… so by the time I did the entry and saved it in final form, it was well past the time when that first notify went out by mistake… my fault for not doing as I usually do – type the entry first and then the title! Bex, when the notice for this entry arrived in the mailbox I followed the link, it lead me to an entry that just said “The”, nothing else! So when I read your entry the following day I was confused about the dinner, what dinner! I followed the link back and found your feast! Mouth watering! I do not know why I torture Ed about the card these days! Maybe because it is fun to get him to step into more emotive shoes — they aren’t ones he usually wears! 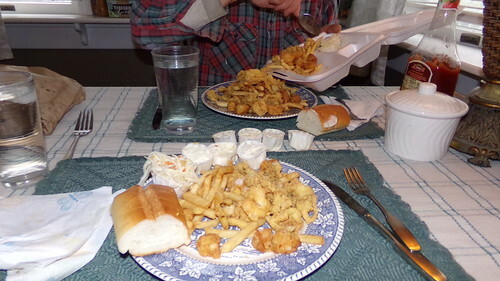 Question for you — do you save fried clams only for your b’day because you want to keep them special, or because they are expensive? Because I think if I loved them as much as you do, I would maybe have them more often! I mean, if we each have twenty birthdays left that’s only twenty dishes of friend clams! Not nearly enough! Wow! It’s after midnight here right now and I’m not even hungry – but your seafood pictures have me drooling, Bex. Color me 5 shades of jealous, that food looks sooo GOOD! So glad your cake turned out well. I might have to try that recipe. Especially with the lemon juice, it sounds like something DH would love. WOW…nice spread you had for dinner and what a nice gift after. I’m also a hamburger lover, Eric… got nothing against them. 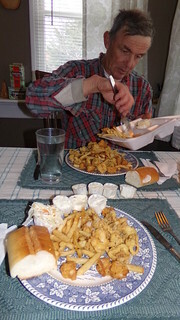 In fact, one of my favorite dinners here is when I get big bulky rolls in and make homemade cheeseburgers with the works including homemade Russian dressing, sliced onion, melted cheddar cheese, lettuce, slice tomatoes, sliced pickles… oh yes… I get them so big that we have a really hard time taking that first bite… and by the end of eating, we are drenched in burger juices… nothing like a great burger! 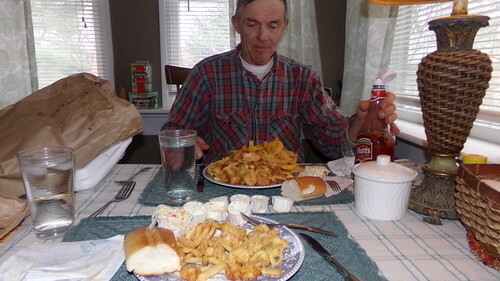 But the question begs to be asked… Eric… do you eat seafood now… in adulthood? I’m getting hungry reading this. I have to confess that when I was a kid I wouldn’t touch any sort of seafood. We went on a family vacation to New England and my parents had to search for seafood restaurants that would make a hamburg for a bratty kid. L’Empress, I do have powdered sugar but I can’t remember the last time I used it! 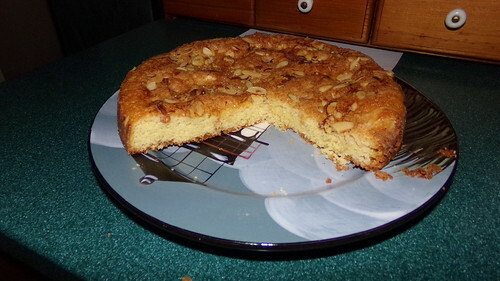 On this cake, I sprinkled sliced almonds on the top, sprinkled “Sugar in the Raw” – about 2 tsp. – over the almonds, and then squeezed about 2 TBSP of fresh lemon juice over the whole top… and that combination made the whole topping a crunchy delicious topping. Perfection… I couldn’t have planned it any better. I love lemon and this cake is quite lemony. My Joy of Cooking, 1964 edition, is currently sitting by the computer (because I copied a recipe for someone). So I found the Lightning Cake, and it would be really interesting if I had someone to bake for. Incidentally, do you buy powdered sugar, or do you powder your own? I tried putting granulated sugar in my blender, when I needed powdered sugar that didn’t contain corn starch. It was fine; I didn’t need the preservative. Sounds like the perfect Birthday for people are age. The cake looks really good!